The Miami Climate Alliance works for equity and resilience by activating community through strategic action, increasing understanding of climate change as a threat to all forms of justice, and building urgency around our shared community well-being. ● We are committed to democratic governance, operational transparency, and open data sharing. Climate change and sea level rise continue to threaten the future of Miami-Dade’s coastline and water supply (Greenprint, 2010). The most recent U.S. National Climate Assessment declared Miami as a city most at risk to effects of sea level rise and climate change (2014). Florida Atlantic University’s methodology for projecting sea level rise predicts that South Florida will see a rise in sea level of about 3-7 inches by 2030 (FAU, 2012), which represents a significant increase from past projections. Now more than ever as we work to build people-centered solutions for living with sea level rise, it is critical that our community demand climate action from our elected leaders. 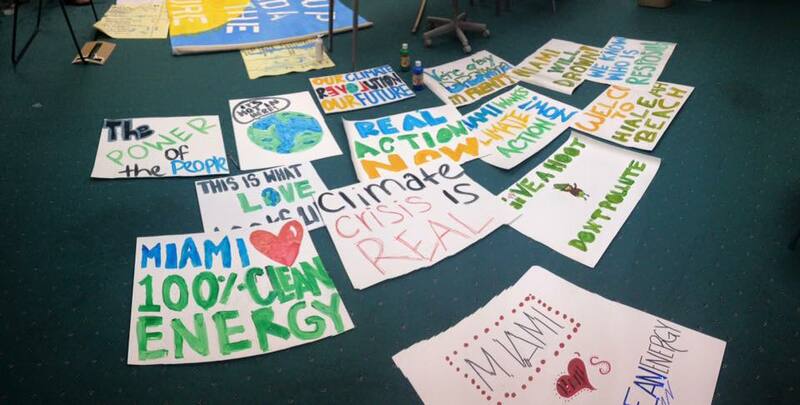 The MCA was convened in 2015 by a diverse group of nearly 100 Miami-Dade residents (including community leaders, students, staff of social justice organizations, environmentalists, scientists, teachers, and climate activists) to organize the Miami People’s Climate March. While hard at work organizing the March, we discovered $0 allocated toward climate action (or mention of climate change) in Miami-Dade County’s $6.8 million FY 2015-16 budget. By mobilizing over 200 informed and passionate residents, MCA efforts during the budget hearings led to the creation of the County’s Office of Resilience and the first-ever Chief Resilience Officer. Since then, the MCA and its member organizations have played a decisive role in building Miami’s leadership within the national climate justice movement. We have played a lead role in securing local and state climate policy wins — including getting County leadership and several local municipalities to support the Paris Accords and policies regarding the expansion of solar through co-ops and the waiver of permit fees for PV installations. The MCA is uniquely positioned to translate climate injustice into systemic change. We act as a bridge, connecting organizations that might otherwise be siloed. As a local hub for climate justice we help members identify intersectional issues, work in coordination with other organizations, and connect with resources, building collective power. We also identify opportunities to advocate collectively and organize diverse voices to speak in unison on topics of importance to all. Our equity-driven agenda intersects with many public policy issues affecting our frontline communities, including affordable housing, mass transit, emergency preparedness and disaster response, food security, extreme heat, tropical diseases, sunny day flooding, saltwater intrusion, and ICE Detainer/Sanctuary Cities policies. In fact, at the FY 2017-18 County budget hearings, dozens of MCA members advocated for issues beyond climate action, including speaking against proposed cuts to public transportation and in favor of additional funding for affordable/green housing – both of which were achieved.